“Hypnotic River of Sound,” being the title of the stellar EP by JEFFERTITTI’s NILE, is more than that – it’s all you need to know to fall for this band. Be thankful it delivers on the title’s promise. Interstellar California vibes, burning up a Stones classic with the dare of a solar flare, and setting fire to new classics in the process. It’s really killer. You may never get your head around the name – it’s not necessary. The river ride is just the same, either way. Pick it up, take the ride, and let our friendly river guide – Mr. Moon himself, Jeffertitti – show us the way. Where does the journey begin for Jeffertitti’s Nile – meaning, where does the inspiration and ability to make the music that you make together come from? Do you find the creative urge – for lack of a better turn – is relatively consistent and of comparable strength among the band members and that you are – much like the Wu-Tang Clan and Voltron – more than the sum of your parts? The desire to unite & explore sonic frontiers, dance & rejoice is deep seated with in our DNA strands. What a perfect way to tune into the positive vibrations and send love beams to outer space. Oh, and yes we are exactly like the Wu-Tang Clan! There is no doubt that this is among the most routine question that could possibly be asked in the standard interview format, but in special circumstances, duty calls. So … how did you come up with the name Jeffertitti’s Nile? More important, how did the band manage to agree on the name? What does the name mean to you? What is the most egregious misspelling you have ever seen of your unique band moniker? I was given the name Jeffertitti in Big Sur, California at the “Festival in the Forest” by Danielle (our drummer). In the early stages of our band, we were playing in NYC under another name. The two of us sat together at a cafe drawing & writing out our vision for “J E F F E R T I T T I ‘s N I L E. ” The misspellings and mispronunciations have been highly entertaining … “Neffertitti’s Jile”, “Jeffertities Nile,” “Jeffertitus” … We all get a kick out of saying the band name to someone for the first time and seeing their reaction! In what one is tempted to describe as a mission statement, the aim of Jefferttiti’s Nile is described as wanting to “transform us to formless and timeless dimensions.” What is it about this state that is so appealing to you? To your audience? Is there a difference? Freeing the self from the constraints of time and pre-conceived form is a beautiful by product of the magic of music. We are all eternal beings that come together and share molecules. It’s that feeling i get when I close your eyes and let the music wash over my soul that I strive to attain. 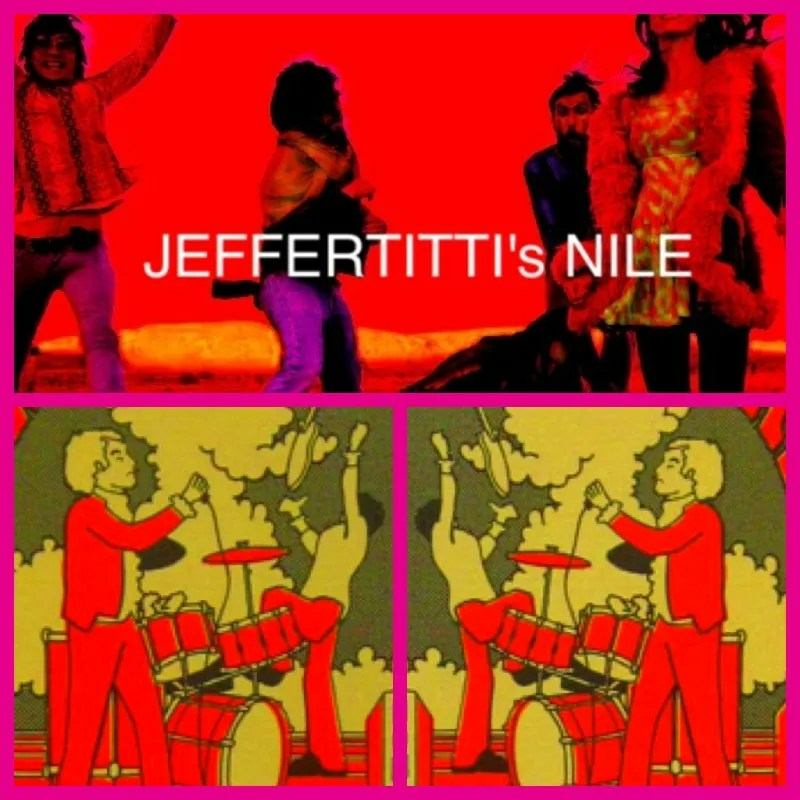 What have you observed regarding the evolution of the music of Jeffertitti’s Nile, from the beginning to present day? What have you observed about the evolution of your audience? How have your personal relationships with fellow band members changed over that same timeframe? My experience has gotten more and more extreme as time goes on. I have a theory that emotions can be viewed on a circular level and that there is a point in the middle in which you are feeling relatively nothing. From that point you can either go up (positive) or down (negative). Once the wheel is spinning (like the earth or a clock), those two emotions are the same, depending on how intense they are. So over time, the farther out on the spectrum of happiness you are, you may experience just as much sorrow, or anger. It’s been my goal to remember that in trying times. As far as personal relationships go … Playing music, sweating, dancing, living, breathing, sleeping, working, traveling, touring, creating with someone is the surest way to find out how your energies vibrate together. I feel blessed to have gotten as close as I have to certain human spirits in this life time. Your most recent release – the EP “Hypnotic River of Sound” – is absolutely stunning. What can you tell us about the mindset of the band as you were writing and recording this music? From this writer’s perspective, a good portion of the aura the album creates is reflected in a quote from Albert Camus: “In the depths of winter, I finally learned that there was in me an invincible summer.” Does that ring true to you – or ring hollow? The music was written and recorded in a small cabin, on the edge of the state park, in Topanga Canyon, CA. One of the most magical places in the universe, for sure. The surroundings greatly effected the vibe of the music and the band. The difference between rehearsing/recording in some dingy warehouse or studio compared to the misty fresh air & sunshine of the canyon is unparalleled. We recorded and mixed the record onto tape in 6 or 7 days. It feels very raw and warm. Doing the record on tape helps limit the amount of over thinking, because you only get 8 tracks and once you lay something down, it’s best to keep moving forward, which keeps things sounding very real and less mechanical. The cover of “Play With Fire” is perfect – a personal interpretation that honors the original. Was this an attempt to reclaim the song from Lil Wayne – or an attempt to show solidarity with Mr. Wayne? Push comes to shove, what is your favorite Rolling Stones song? Have you ever been 200,000 light years from home? ::)(:: “It’s so very lonely” ::)(:: Did Lil’ Wayne cover the stones? I had no idea. How important is the live ritual to the path of Jefferttiti’s Nile? Is it ever difficult to get yourself in the right frame of mind to perform these songs? Or do you look at each performance as an opportunity to be taken advantage of? Music is nothing without ears to hear it. The energy the crowd (dancer/listener) bounces at you is just as important if not more so, than the energy of the musicians. Every moment is an opportunity and each could be our last. I like to try and always remember that. What music have you been listening to lately? What (if anything) does it mean to be a band from California in 2010? “Bembeya Jazz National” has been in heavy rotation. I love discovering and being turned onto new sounds. We listen to a lot of old recordings, but also I am very into supporting and celebrating what is happening here and now! 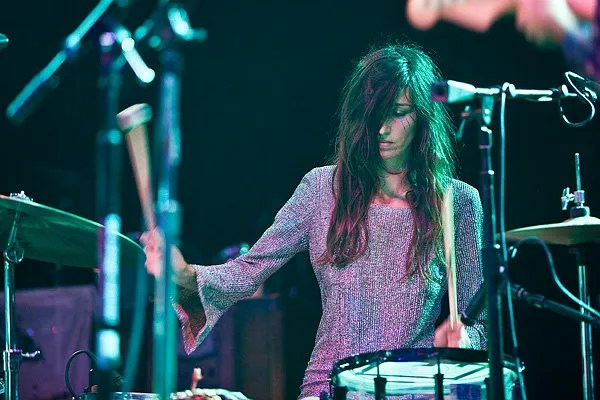 Dahga Bloom, Warpaint, Lumerians, and Bright Black Morning Light are some amazing current bands that have made some stellar recordings. I feel blessed to have our paths cross. Eero Saarinen – the Finnish-born architect perhaps best known for designing the Gateway Arch in St. Louis, MO – had this to say about architecture: “I think architecture is much more than its utilitarian meaning – to provide shelter for man’s activities on earth. It is certainly that but I believe it has a much more fundamental role to play for man, almost a religious one. So to the question, what is the purpose of architecture, I would answer: To shelter and enhance man’s life on earth and to fulfill his belief in the nobility of his existence.” Your thoughts? How does this conform with your views of your own artistic urges? < Technology >< Nature > I am so thankful for things like houses, showers, electronic beat machines and computers, airplanes and cellphones. I also have had moments of deep sorrow when contemplating the idea of a concrete covered earth, and air conditioning addicted television zombies. I would love to find the middle ground between honoring the sacred nature of all things, and innovations of creative technology, co-existing together. What’s next for Jefferttitti’s Nile? Self releasing this 12″ EP has gotten us all excited about making records. We plan on releasing a couple 7″ splits to tide us over and continuing to play all ages shows with our favorite bands that inspire us every night. Australia is calling and I foresee an overseas voyage coming soon.